One of my absolute favourite films of all time, not just horror, but dark dark comedy coming your way! 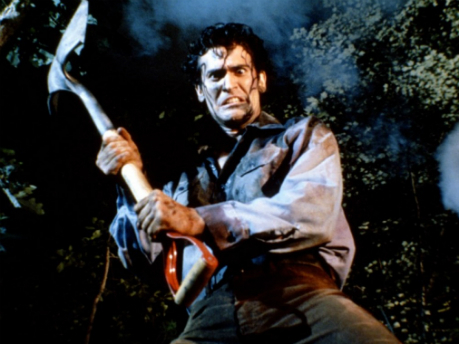 Evil Dead II is the perfect blend of gory horror schlock and goofy black as hell comedy. The movie takes over where the original left off. Contrary to popular belief it is not actually a remake but a continuation of the story. Whilst yes it is in the same house and lots of gory nonsense happens it does actually build on the story. Ash has been thrown across the forest and is now mutating into Good Ash and Evil Ash a separation that will set us up nicely for the third movie in the trilogy. Of course this is the movie that inspired my own attempts at movie making with Dead as a Doornail, so I have to give this film 5 thumbs up!